Load images via http or using bytearray? which the best way? It was long time since I wanted to perform this kind of test, but for different reasons I never had the time to do that. Some days ago fnally I’ve found the time thanks to a project I’m involved into. A local webserver running flash remoting via pyamf and a flash standalone application which need to load tons of images locally. I’ve noticed that sending from amf the list of images path to be loaded required too much time (for me), even if they’re loaded locally. Because of this I decided to try a first benchmark loading a single image using the standard way: send the link from amf and then load it using the classic actionscript Loader. The second test was to send directly from amf the image stream using a ByteArray and then loading the image in flash using the Loader.loadBytes method. In this way I’ve noticed that the second task requires less time than the first one (more or less 40% less). Unfortunately our application needs to load something like 50/100 images at the same time. For this reason I did a new test loading 22 images of 500Kb each (10Mb total). For a better result I decided to use both pyamf and blazeds, to be sure there’s no problems in the language used. Moreover I used charles to register the benchmark of these tasks. First test: passing form amf the list of url images and loading using the standard flash Loader to load all of them simultaneously. The time elapsed from the flash method call to the results was about 40 milliseconds. Then from the remote method result to the completion of all Loader about 1400 milliseconds. Second test: passing from amf an arraycollection of bytearrays containing all the images stream to be loaded directly in flash. The time elapsed form the flash method call to its result: about 2900 milliseconds. Time elapsed from the result to the all Loaders completion: about 900 milliseconds. This results were unexpected for me, expecially because both with blazeds and pyamf sending 10Mb of bytearrays tooks something like 3 seconds! At a first impression I thought the problem was the time for java and python to create the amf stream data, but after a deeper test I discovered that they took more or less 30ms to generate the amf stream and the real bottleneck was the http transfer of this stream data. In conclusion. 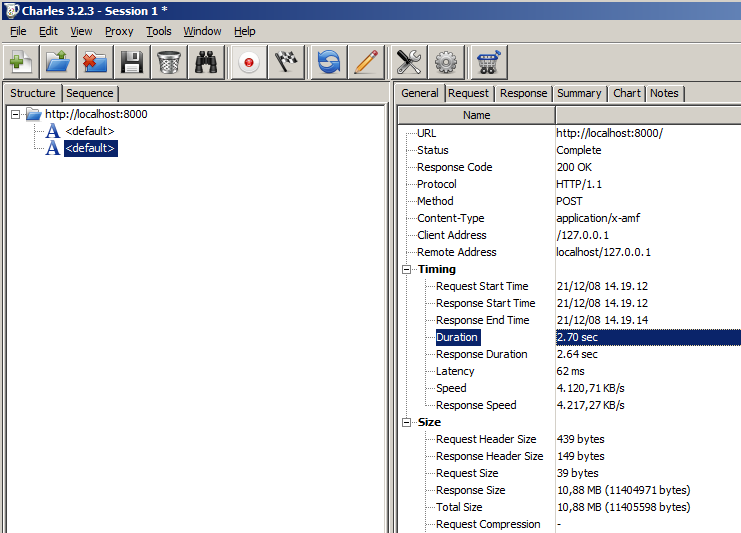 While sending 10Mb of data ( for example bytearray ) requires more or less 2.5 seconds using flash remoting as single requests ( because the transfer rate of the webserver it’s about 4Mb/sec ), loading simultaneusly 20 images from the webserver, using http, tooks 1 second. This is because the webserver for each requests opens a different thread to dispatch the request and in this way the total time to perform this task is less than the first method. Recently I made some test in AMFPHP sending an retrieving ByteArray to be stored in a mysql blob field. After some investigation I found that the error was into the AMFSerializer.php file in the writeAmf3ByteArray method which doesn’t reference correctly the bytearray objects. Thus I made a little modification and after that I succeeded to retrieve correctly the bytearray list ( with the 3rd element as reference of the first one ). Today I’ve read a couple of guys who posted about the new Ted’s post on his blog. Nothing new about amf, just some “best practices” on how to save using writeObject and readObject ByteArray’s methods. Does anyone know anything about this? I can’t wait! Flash Media Server 2 and ByteArray? I thought it was possible, using flex2/ActionScript3 new features, to send a ByteArray object using the NetStream.send method, but it doesn’t seem to work. Finally I found the time (not so much) to play a little with Flex 2 alpha and ActionScript 3.0. So I’ve created a porting of the GNU gettext class for ActionScript. I’ve got this wish since a long long time, but it was always impossible without the new ByteArray class. For the complete article read here, also for an explanation of gettext. The project is hosted on google code here. logger.text += text + "\n"